In hand-assisted laparoscopic radical nephrectomy, a 7-8 cm incision is usually required to accommodate the surgeon's nondominant hand. Some authors have advocated the use of hand-assist devices because they can act as a bridge between open and purely laparoscopic surgery; to wit, in most circumstances, hand-assisted laparoscopic radical nephrectomy has reduced operating room time when compared to standard or, in some series, even retroperitoneal laparo-scopic approaches. Although hospital stay and convalescence are similar, operative times have been reported to be faster than the standard transperitoneal approach by as much as 30%. In patients who need peritoneal dialysis or have a history of multiple abdominal procedures, retroperitoneal retroperitoneoscopic radical nephrectomy is the surgical approach of choice. Some authors have advocated the use of hand-assist devices because they can act as a bridge between open and purely laparoscopic surgery; to wit, in most circumstances, hand-assisted laparoscopic radical nephrectomy has reduced operating room time when compared to standard or, in some series, even retroperitoneal laparoscopic approaches (2,6,7). Major disadvantages of the hand-assisted approach include difficult placements of working ports in small patients, hand fatigue, larger incisional scar, and increased rate of wound complications (8,9). Nevertheless, when compared to the standard laparoscopic approach, the use of the larger incision for the hand port did not translate into meaningful increases in the postoperative convalescence time (3,6,7,10). There are six types of commercially available hand ports at the present time. 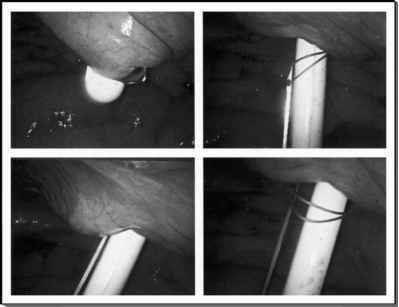 Although each device has its own merits, no clear pattern of preference was seen among laparoscopists (11). In general, we recommend a device that is self-coapting (e.g., LapDisca or GelPortb), because this allows the surgeon to use either hand, eliminates the use of cuffs or sleeves, and provides rapid entry and exit.